The Puzzle of Plastics: Is there a solution to single-use? Professor Richard Thompson, Head of the International Marine Litter Research Unit at the University of Plymouth, discusses the major environmental challenges that plastics present and some possible policy solutions. Humankind produces 300 million tonnes of plastic every year, and we’ve been mass producing it for more than half a century. But we are to some extent a victim of our own ingenuity. In its various material guises, plastic is durable, versatile and inexpensive, and brings considerable benefit to society. However, its ubiquity brings issues, particularly as 40 per cent of production is for single-use items that are discarded within a year. This creates a major environmental challenge because all of that end-of-life plastic accumulates in waste management – or worse, as debris in the environment. Through our work we know that a single plastic bag could be shredded into more than 1.75 million fragments once it enters the marine environment, and that a single wash load of acrylic clothing can release 700,000 microfibres. We learned that facial scrubs could contain up to 2.8 million microbeads, which was one of the key pieces of evidence that convinced the UK government to legislate against their use in wash-off cosmetics. 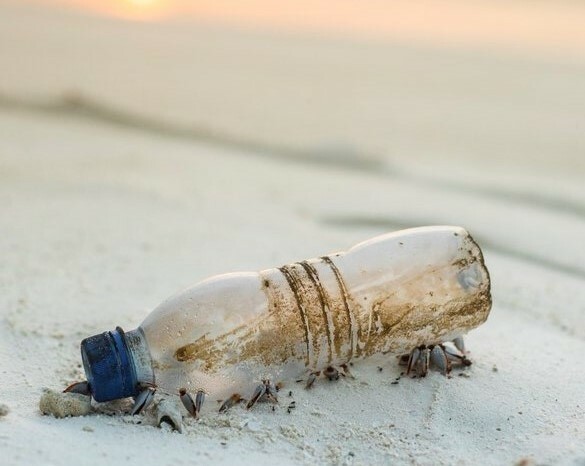 And for the 700 marine species now known to encounter litter in the environment, the vast majority of these encounters are with plastic, with many of these encounters either harmful or fatal. Every discovery raises further questions and opens new lines of enquiry. For example, we recently received government funding to investigate the relative importance of tyres and textiles as sources of microplastics to the marine environment. Thankfully, the wider world is also waking up to the global threat posed by marine litter, and marine plastics in particular. But recognising the problem is one thing; increasing knowledge and changing behaviours is a far greater challenge. To really address this issue, we have to inspire people to change behaviours right along the supply chain and it is for this reason that psychology is a key aspect of our research, to consider how enhanced education can be part of the solution. Some unnecessary items such as single use plastic shopping bags, disposable coffee cups, and drinking straws are all tipping towards being phased out or at least radically reduced. We are becoming increasingly aware of the external costs of our current production, use and disposal of plastics. These include negative effects on the environment, the economy and human well-being. This awareness brings with it a real opportunity for business to move toward more sustainable product design and increasing compatibility with a more circular economy. Indeed, before the British government banned the use of microbeads in cosmetics, our research found than many manufacturers had already removed or reduced them considerably. There is no single answer to solving a major societal, systemic issue such as plastic waste, pollution or marine litter. And we as scientists have a crucial role to play in providing the robust evidence that can guide industry and policy-makers into making informed decisions. But there is one single constant throughout the whole issue – we, the public, are fundamental to the solution. Can we strike the right balance so that the benefits plastics bring to society can be achieved without the need for emissions of debris to the oceans and natural environment? It’s a problem that we all have a stake in and with smarter thinking on the production, use and disposal of plastics it is one that can be overcome.